The week after the Japanese test, I booked airline tickets and a hotel for five days and four nights in snowy Hokkaido, the northernmost of Japan’s islands. Oddly, I didn’t even consider it an obstacle that the payment would require a bank transfer. Last December when I paid for my laptop, it had taken me some twenty disheartening minutes to understand the words, “Don’t do the transfer here—take the money out in cash and deposit it at the bank next door, it’ll be cheaper.” But this time, except for one symbol on the bank machine, I think I could have figured it out on my own. It took no more than three minutes with staff assistance. To get the cheapest possible deal, I booked tickets from the morning of Monday the 23rd to the afternoon of Friday the 27th. The Toronto Girl had offered to let me stay at her place in Tokyo before the flight, and I was leaving to meet her on Friday so we could go out and hit some clubs over the weekend. On Friday we had a half day at school, and I just helped out a little with the year-end cleaning. In my wanderings, I pleasantly encountered some of my favourite grade five girls. A minute later I looked up and realized, “Oh crap! Those kids are fighting!” and subsequently broke up my first fight as a teacher. I spent the rest of the morning tracking the courier number on my ticket delivery. My agent had decided to wait until the last possible moment to send it. I stepped on a bus to P. Rock shortly after the courier knocked on my door at 1:10. In P. Rock I would be handing off the fake Christmas tree I’d been carting on my back for four weeks to E and Bugsy, the only ALTs sticking around over winter vacation. Everyone else in the area had gone home for the full two weeks, thus rendering it absolutely imperative that I go away and ski. If I were doing anything else, I would be horribly depressed on Christmas Eve. That logic didn’t precisely hold, mind you. I arrived in Tokyo with my Big Purple backpack absolutely stuffed to the brim, containing not only a week’s ski gear and clothing, but also my smaller green backpack for carry-on. I then decided that this was a perfectly suitable way to walk around Shibuya at 7:00 on a Friday night while I waited for The Toronto Girl to finish work. Shibuya is crammed with more people than you can imagine on a New York street corner, and I was navigating it with all the grace and dexterity of an ambulatory refrigerator box (I’ve seen what that looks like, too—my friend had a ill-advised Halloween costume in elementary school). In the end, the weekend involved a lot of surprisingly cold weather, very little movement, and no clubbing whatsoever. We were too worn out to do anything on Friday, and on Saturday I went out for a late dinner with my former kendo sensei’s son while The Toronto Girl opted out. Around the time we finished reminiscing—11:45 or so—I discovered that in a city of 10 million people the subway stops running at 12:30 a.m., after which time there are no night buses. The cabbies do, however, conscientiously raise their prices. Deciding that we didn’t feel like being locked in a club until the subways started up around 5:00, I caught the second-last train halfway back to The Toronto Girl's place and then waited twenty minutes in line to pay a cabbie ¥2500 for the distance of a ¥190 subway fare. Madness. Sunday consisted of little more than dragging The Toronto Girl to the new Harry Potter movie and planning the route I’d need to take to Haneda Airport on Monday morning. Rather than facing the historically unavoidable ¥2500 fare for the one-hour Narita Express, it turned out that I only had to pay ¥470 for a thirty-minute, problem-free monorail ride. Monorails are neat. They bank. I’d allotted tons of time to get through the boarding processes, but it turned out that all I had to do was stick my ticket into a machine and select a specific seat—or rather, get one of the airport staff to do it for me—and I was at my gate within ten minutes. In the waiting area, they had a glassed-in, massively ventilated box to keep the smokers isolated from everyone else. Even the carpet around it was a different colour, as if to indicate the estimated fume radius. It was only an hour and ten minutes from Haneda to Sapporo, the capital of Hokkaido, but I boarded what turned out to be a fairly full 747, holding up the line as I tried to figure out the little machine that ate my ticket and neatly spat out my boarding pass. The buildings in Hokkaido even looked like smaller versions of what you’d find anywhere in Canada. The instant I walked into the Keio Plaza Hotel, an eager staff member insisted in English that he take my bags, planted me in front of the lone gaijin clerk, and left me there to fumble through my backpack for my reservation coupon like a forgetful buffoon. Mr. Eager politely invited me to use a low table that had been placed to my right For Your Fumbling Convenience while I carefully held my tongue lest I politely invite him to do something uncomfortable. A bellhop I wasn’t sure if I was supposed to tip or not insisted on taking my backpacks up to my room for me. In a way, I was impressed that the hotel was so bent on service, but I guess it just sets me off when people assume I can’t do things for myself—like communicate in Japanese when I have to do it every day of my life. The gaijin clerk gave me some maps and directions around town, and I took a streetcar to reach Moiwa-yama, the small mountain that interposes itself into the south end of Sapporo. I took a gondola and then a silly one-person chair lift to the top of the mountain just as it got dark. From the peak I snapped shot after shot of the illuminated sprawl of Sapporo, a vast plane of low-lying buildings bounded by the ocean on one side and dark ranges of mountains on the other. And not a single bloody picture turned out because cheap disposable cameras can’t take night photos. When I got back to the station, I took the train to Otaru, which features a canal lined with gas lamps and hundred-year-old buildings. The buildings, however, largely looked like warehouses, and the canal really had nothing going for it aside from the lamps, so I was generally unimpressed until I was lured into the Otaru Beer Pub by an arrangement of about 300 glass-mounted candles creatively stacked out front. Inside, I found the first place I’ve ever though I would like to visit once a week for the rest of my life. I ended up nestled in a cozy hardwood interior eating an inch-thick ham steak and some amazing appetizer essentially nemed “The Totally Good Bacon and Potato Fried Thing”—which fully lived up to its name—and finished everything off with apple strudel of the sort I would have had if I’d been at home on Christmas Eve. Then a five-piece band came on and played something that was probably jazz but so much better than any jazz I’d ever heard, and I ate my strudel and listened to the keyboards, drums, trombone, sax, and fantastic clarinet trill out funky, energetic versions of assorted Christmas carols. I only lamented that I’d found the place on December 23rd rather than the 24th. Sitting on the second-last train back to Sapporo an hour later, I started to wonder if Otaru needed an English teacher. Then I nearly got locked in the subway system at midnight as I tried to find an exit closer to my hotel. Sapporo beat Tokyo for early closing times. I got on the bus organized by my tour package and traveled about an hour with no more than six other people to something shaped vaguely like a big baker’s cap growing out of a low mountain range. Teine Highland was the site of the 1972 Winter Olympics for reasons that escape me. The place was steep, but there were only eight runs, and they weren’t especially long. I bought a six-hour lift ticket and opted out of the gondola, which I later noticed had been ingeniously designed such that it had a total of two cars that could only take on passengers when they were simultaneously docked at either end. But the place’s shortcomings didn’t faze me in the least: I was going to ski for the first time in two years, and I was hyped. There was a fairly nice run that arced along the top of the mountain and then curved down the front, and while the lower portion was in shadow when I arrived in the morning, I anticipated skiing it for hours when the sun came over the mountain in afternoon. I don't know how it's possible, but the sun never came over the mountain. The sun somehow rose and set on the same side of the mountain, and the trail was never illuminated beyond halfway through the curve. I ended up spending most of the day on something called The North Wall, which I’d describe as a “double-black lite.” It was steep, but not to the extent that you had to be standing still to control your speed, and covered with moguls that went only up to your thigh, and actually had enough snow on it that you could dig in your edges without sliding off the trail. This didn’t keep me from beating myself to a pulp every time I went down, but the big bumps compensated for the lack of light, so I did it eight times and rendered my body incapable of moving for the next three days. Did you know that beards catch snow? And if you fall hard enough, snot can land on your glasses. I wear a pair of red cow boxers on my head when I ski. They’re sewn onto a headband and are actually warmer than any hat I own. I use them to generate conversation in the lift line since I get bored just skiing on my own. The only problem was that at Teine, there weren’t enough people to make a lift line. The one time I had a chance to scoot up and sit beside someone I atually let it pass since I felt bad sticking some unsuspecting skier with a boxer-headed weirdo. I’d forgotten what it was normally like to be a gaijin in Japan, and I started to get antsy when people in the cafeteria would just follow me with their eyes without saying anything. The entire day, the only people I spoke to were the guys at the rental shop, the lady at the ticket booth, and the guide from the bus I rode in on. It was December 24th. That evening, I was absolutely determined to find the Bazoku Bar & Grill, which Lonely Planet indicated as Sapporo’s number one gaijin hotspot, located “somewhere near” the Tanuki-Kōji arcade. The arcade turned out to be about eight blocks long and “near” a lot of places, none of which seemed to be named Bazoku. I wandered up and down every street along the arcade for an hour and a half, and just as I was about to give up I spotted my third gaijin of the night and decided to ask her where the heck I could find the place. But just as I caught up to her, she ran into a group of friends who were waiting outside “Cam-Cam”, another noted gaijin hangout, which was packed to the gills. If I’d just been looking for a specific restaurant, I would have asked. But what I’d really been looking for were some people I could wish a Merry Christmas to and get a natural response. I couldn’t do it. So I turned around without a word and headed back downtown. I considered going back to Otaru, but I just couldn’t bring myself to go to the same restaurant alone two nights in a row. Christmas Eve is a couples’ night in Japan, and I was pretty much the only person walking around alone. Just about every other guy seemed to be accompanied by a girl who’d decided that a miniskirt and high heels were totally appropriate gear for snow and –8˚C weather. I’d been hoping to at least see a movie to kill some time, but all the theatres closed early. So I decided to sink as low as I possibly could and ate Christmas Eve dinner at McDonald’s. 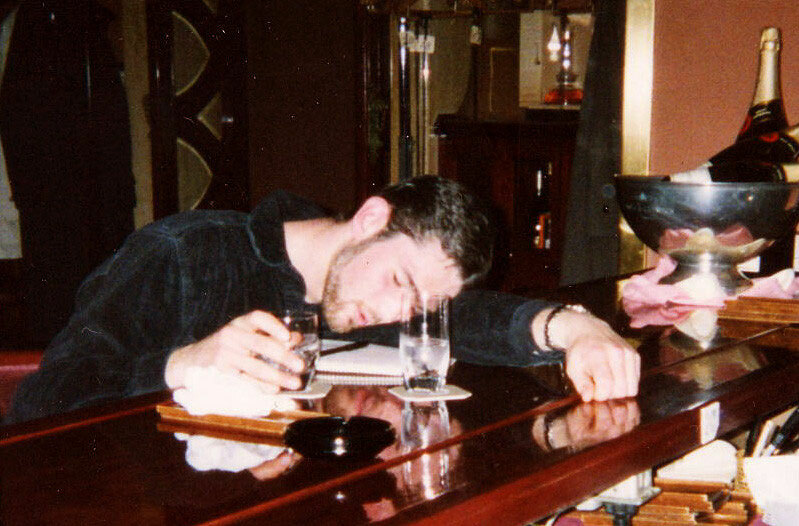 Then I went back and finished the night in the hotel bar. Although I didn’t feel so bad any more by the time I went to the bar. 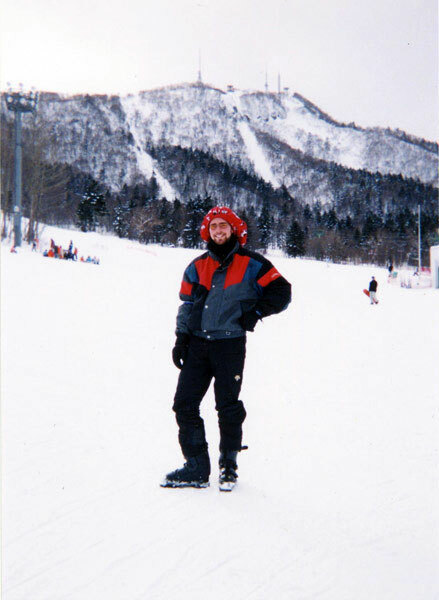 I’d had a great talk with a high school buddy who’d surprised me by coming to teach in Japan a few months ago, and he was visiting Kyoto and quite envious that I was skiing somewhere while he wasn’t. I have him to thank for turning around what had otherwise been a very socially dismal day, and in the end I went to the bar out of a sense of perverse amusement rather than any kind of dolour. I even convinced one of the tuxedo-clad bartenders to take a photo.